The St. Sofia church in Harbin is located close to city center, and is only a 15 minute walk from Zhongyang (Da Jie) Street. St. Sofia church construction began in September of 1923, and completed in November 1932. The church features Byzantine architecture covering 721 square meters, and is 53.35 meters tall. 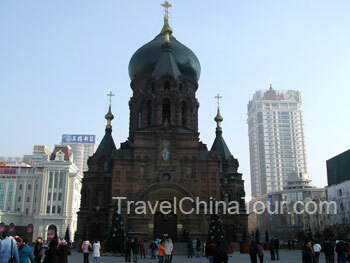 This is the largest Orthodox eastern church in Harbin. 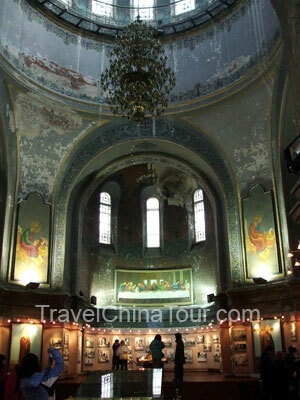 In 1996, St. Sofia church was designated as the Harbin Architectural Art Gallery and Museum. Since its renovation in 1997, St. Sofia church attracts tourists from all over the world. The St. Sophia Orthodox Church. My hotel (Tianzi Hotel) is located right in the middle of Zhongyang Dajie (one of the busiest pedestrian only streets in Harbin), and since I had a relaxed schedule that day, and the St. Sofia church is only a few blocks away, I woke up late and didn't leave the hotel until 9:30am. Walking about 5 or 6 blocks heading southeast from my hotel on Zhongyang Street, it took merely 15 minutes. I also stopped at McD's for some quick breakfast on the way. I counted at least 2 McDonald's and 1 KFC located on Zhongyang Street. Large paintings on the walls and a large chandelier hanging in the middle of the building. The first section begins right after you enter the church, and here, there are a total 77 historical photos showing the development stages of Harbin - how Harbin went from a small town and developed into a large city. 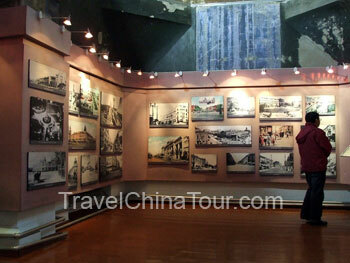 In the end of the 19th century, Harbin was still a small settlement town with farms and small markets. At the start of the 20th century, the city began to grow from a small village and developed into the city it is today. Many of the photos show scenery of what it looked like at the end of the 19th century. Black and white photos showing how Harbin looked over 100 years ago. The second section has 116 black and white photos and some faintly colored photos on display. These photos show the development process of Harbin, and the influcence it had from western culture and western architecture. Because of its close proximity to Russia, Harbin was heavily influcenced by Russian culture and architecture. There are many photos showing various european style buildings throughout Harbin city, making the city a museum of eastern and western architecture. Along with the black and white photos, there were a few faintly colored photos showing different architecture in Harbin. 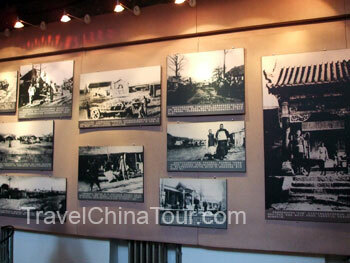 The third section displays 107 photos documenting the social and cultural progress of Harbin in the 20th century. Photos here include images of western ballroom dancing, western symphonies, theatrical plays and much more. 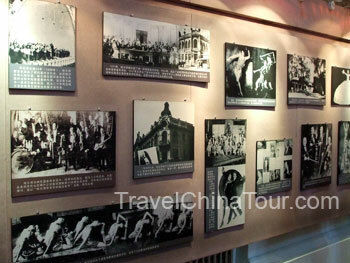 Black and white photos showing the social and cultural development of Harbin. After touring the photo sections, I headed to the rear cloister of Sofia church. The rear cloister was originally used as the main resting place for the clergy. It also served as the changing area for ceremonies and such. The rear cloister is a pretty small area to see, and once that was done, I came out the other side back into the main hall of the church.